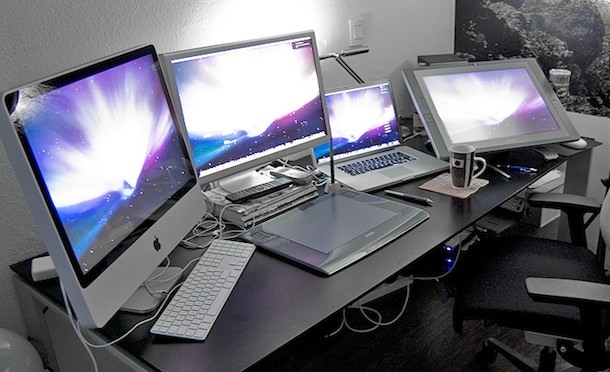 This awesome Mac setup from features a 27″ iMac, Apple Cinema Display, a MacBook Pro, and on the far right a Wacom Cintik 21″ tablet screen that lets you draw directly on the display. I guess that tablet is about as close as you can get to a touchscreen Mac at the moment. And the Amazon price for Pavilion Electronics is an absolute rip off – Wacom’s selling it direct for $800 LESS than P.E. Not enough symmetry for me (not clean enough). He could at least change the background.